Ripe autumn pears teamed with balsamic vinaigrette make this sandwich unexpectedly delicious. Mix dressings; spread bread evenly with half the dressing mixture. Place, dressing-sides down, in skillet. Spread with remaining dressing mixture. Top with turkey, pears and cheese; cover skillet. Cook on medium-low heat 5 min. or until bottoms of sandwiches are golden brown and cheese is melted. 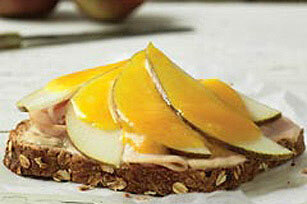 Prepare using KRAFT DELI DELUXE Process American Cheese Slices and substituting a small apple for the pear.